Retail Pharmacies and Drug Stores generate medical waste like any other facility or business that’s related to the healthcare industry. With blood drives, immunizations, expired medications, and other testing materials that pharmacies work with on a regular basis, the need for secure and safe pharmaceutical waste management and medical waste disposal for sharps and regulated waste is a necessity. Pharmacies are also a point of contact for the public for expired medications and used Sharps materials. That’s why pharmacies have the requirements in place to handle medical waste properly. Medical Waste Pros can connect pharmacies throughout the United States with a reputable medical waste disposal company to ensure that they’re protecting their employees, customers, and sanitation workers by disposing of Sharps and regulated medical waste properly. Pharmaceutical Companies also generate their fair share of medical waste- they are required to comply with the same medical waste disposal regulations for any substance that’s defined as a hazardous material. If they’re conducting testing onsite, proper disposal of any contaminated materials and Sharps also need to be handled safely. To get free no obligation quotes for storage containers, pickup service, and mail-back solutions, give us a call at (888) 755-6370 or just fill out the form to the right. Medical Waste Pros offers several options for proper Sharps disposal for pharmacies that offer regular immunizations. You can select from a mailback system or order a larger container that a local medical waste disposal company can pick up on a regular basis. All Sharps Disposal Containers from our network partners adhere to OSHA, EPA and State regulations. 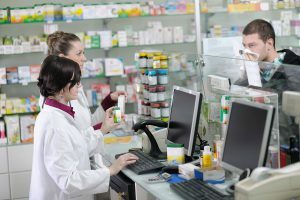 If your pharmacy handles hazardous pharmaceuticals on a regular basis, you need to ensure that you comply with all state and federal regulations. Don’t get stung with hefty fines because of improper disposal of hazardous pharmaceutical waste. Let Medical Waste Pros help you find a company to ensure you don’t incur thousands of dollars of fines per day for non-compliance. The Secure and Responsible Drug Disposal Act gives pharmacy customers the ability to bring expired or unused controlled (schedules II-V) and non-controlled medications to be disposed of properly. Medical Waste Pros can provide the DEA-approved containers that allow customers to drop off their medications anonymously- or supply you with a mailback system to ensure that all medications are disposed of properly. No matter which system you choose, we’ll connect you with the right provider in your area. Medical Waste Pros can help you develop a program that ensures you comply with all required regulations, and even assist you in finding a professional medical waste disposal company right in your area to help you with training and proper medical and prescription disposal management. We’ll help you select the containers, schedule, and system that works best for your organization. To get free quotes on common medical waste disposal, fill out the form to the right, or give us a call at (888) 755-6370.